What is it with human beings always trying to fix each other and make us all the same so we fit into a box of being and looking the "right" way? The latest example that keeps coming up on my radar is gay conversion therapy. Not that this is a new human endeavor. It just keeps coming up. I recently saw the movie, The Miseducation of Cameron Post. Cameron, a teenage girl who is attracted to girls, gets sent to a gay conversion camp run by religious people. Camp is bad enough but Gay Conversion Christian Camp? What could be worse? 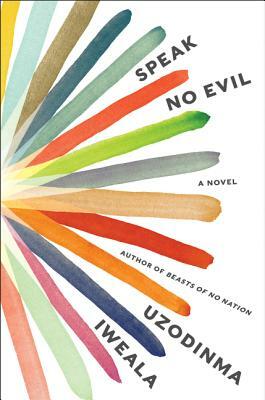 Speak No Evil revolves around the teenage son of Nigerian immigrants in Washington, DC and the white girl who is in love with him. When Niru becomes aware of his sexual orientation (gay), his father drags him back to Nigeria to the village church where he is prayed over so he can cast the evil from himself. That scene is like a compressed version of the one in James Baldwin's Go Tell It On the Mountain. Of course, Niru is not cured. He just has to go underground while still living at home. When Meredith realizes why Niru does not return her advances, she flips and supports, even encourages, his inclinations because first and foremost they are best friends. Tragedy ensues. Nearly everyone in the novel is destroyed in some way. This is a powerful novel, full of surprises that creep up on the reader. I finished it almost a week ago and it took me all this time to figure out what it meant to me. I still don't have it all figured out, except that it behooves no one to play God. This sounds good but possibly a bit disturbing. Violence and bigotry aimed at LGBT folks is one of the great tragedies of human history. Gay conversion therapy is a foul mix of irrationality and cruelty. Hopefully it will soon be a thing of the past. I am with you Brian. The title of this novel goes both ways! That sounds like a wonderful, and heartbreaking, book. It is strange, isn't it, that humans so often seek conformity in others, i.e., that they conform to our ideas of what a human should be. Why can't we just accept individuals for what they are and appreciate the differences and the various permutations of being human? Maybe the only thing good to come out of such attitudes is some powerful literature. Good point. If the world were a better place what would we have for literature? It seems that the plight of the LGTBQ+ community is being mined relentlessly by Hollywood these days. Thanks to that, we've come to know the terrible things that have been done to "fix them". This book sounds like a powerful testament, albeit fictional. Another movie on that topic this year is Boy Erased. I have yet to see both. Hopefully awareness is being raised. Yeah these conversion stories are difficult to stomach. I guess Boy Erased is on rental now and I'm getting up the courage to see it. It likely doesnt have a brutal ending like this novel seems to. What a heartbreaker! Yes. I have not seen Boy Erased yet. In this book, the color of Niru's skin is also a factor. Yes, agreed... It behooves no one to play God. Well said. I definitely could not read this one. I have too many fabulous men in my life and it is so heartbreaking to think this could have happened to any one of them - though luckily all have come from really supportive families who have not tried to change them. Lovely review Judy, well done. Thank you Sarah. I understand your feelings and I am happy for your friends.